Oh well I went to see the specialist today and after lots of nose and throat prodding, some really unusual blood test and a script for nose spray that is so new it has to be ordered, I am now on a waiting game to see what the tests show. But on a happier note I am preparing for my weekend in Tasmania with my cousin Susan. The accommodation - car hire - dinner arrangements and "Quiet Cone" is all booked and just waiting for us to be there. We are both so looking forward to spending a weekend together doing just what we want to do. Being an only child I am really lucky to have grown up so close to Susan, she is the sister I never had. 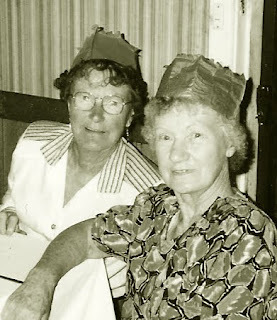 Our Mums - Joan was my Mum and Jean was Susans Mum -are sisters (both have left us now) and they were two of 13 children and extremely close. They were so different but also just like two peas in a pod. From what Mum had told me they shared so much of their lives that they were just intertwined together. I loved Auntie Jean - she was definitely my 2nd Mum. I love this photo and it's so good that you had a cousin that you were and still are close to. I am so blessed to have the three sisters I do and often take for granted that they are here. Thank you for reminding me to be grateful tonight. The weekend sounds like you are in for a great time, I hope that you have the time of your life! Please keep me posted when you get your results in, I sure hope that it is something minor! Really hope you have had a good enjoyable weekend. After catching up with your postings, sounds like you've needed this past weekend. Hope your father is much better after his fall. Hope your weekend was wonderful. It's great spending time close family. Enjoy!